Ubisoft is out to build on the success of its "Far Cry" video game franchise with a new installment promising players more choices and smarter enemies in an expansive world. The action-adventure game set for release on Tuesday will be the fourth edition in the series, which has sold a reported 20 million copies since the first version was released in early 2004. About half of those sales have been credited to "Far Cry 3," which won legions of fans after it hit the market at the end of 2012. "Far Cry is a sleeper in some ways, but it is building momentum," analyst Scott Steinberg of high-tech consulting firm TechSavvy told AFP. "It has become a popular franchise but still has plenty of room to grow." "Far Cry 4" due out on Tuesday was billed as the most expansive and immersive version yet of the open-world, first-person shooter game. While its predecessor played out on a tropical island, the story in "Far Cry 4" is set in a fictional region of the Himalayas serving as a stronghold for a self-appointed despot. 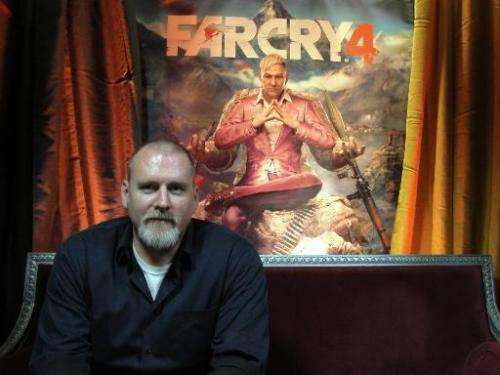 "The first idea for Far Cry was not to put it in the mountains; it was that someone on the team wanted to ride an elephant," game executive director Dan Hay told AFP while providing an early glimpse at the new version. "Maybe we took a hard road, but we asked what we wanted to do as game players." The Montreal Ubisoft studio behind the game set out to imbue "Far Cry 4" with features people loved in its predecessor and unexpected new twists. For example, players can indeed ride elephants while attacking mountain fortresses that Hay described as "outposts on crack that can fight back." Artificial intelligence built into the game has resulted in virtual enemies even surprising its creators with reactions to situations. Even the fictional villain in the game, a character named Pagan Min, is billed as deviously insightful. "Everyone has that friend in the past who was bad for them," Hay said while describing Pagan Min. "They are a blast to hang out with; but if you hang out with them you are going to wind up dead or in jail. This is that guy." Along the way, the new version of Far Cry calls on players to choose between tradition and seizing new opportunities in the Himalayan realm. "Far Cry asks you to take a digital year of your life and meet credible characters who will challenge your assumptions," Hay promised. "After finishing school we start with the idea that we are going to get it right; better than our friends or parents - Far Cry gives you the choice." Versions of the game for play on current and previous generation Xbox or PlayStation consoles, as well as on computers powered by Windows software, will launch at a price of $60, according to France-based Ubisoft.